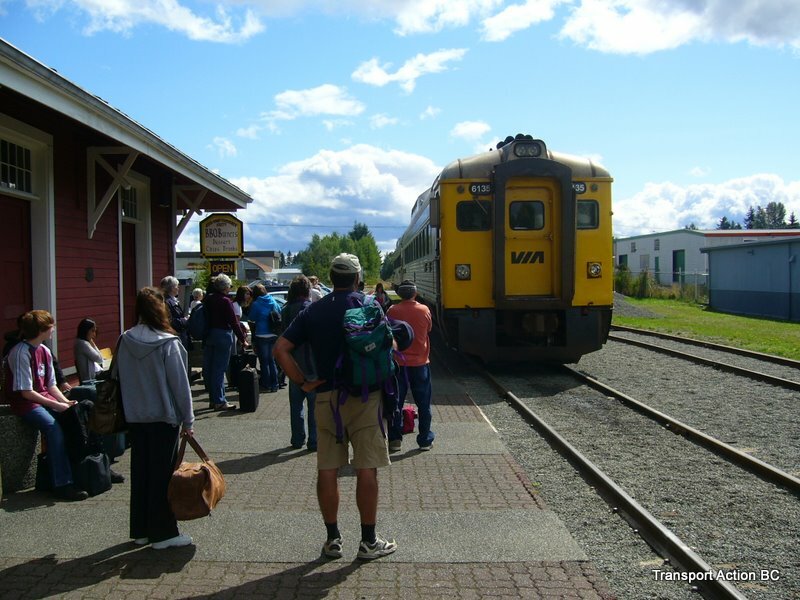 The Island Corridor Foundation which owns the former Esquimalt and Nanaimo railway on Vancouver Island has put forth a new plan to rehabilitate the track between Nanaimo and Victoria, switch the terminus from Victoria to Nanaimo and add additional VIA service to the line. You can read more about the service plan on their page. This is a less ambitious plan than a few years ago, but it would be a vital first step to revitalising the railway and increase the patronage on the trains. The plan would introduce an early morning run from Nanaimo in the morning appealing to commuters before the traditional departure from Nanaimo, up island to Courtenay. In the afternoon the train would arrive back in Victoria in time for take the Victoria commuters back to Langford, Duncan and as far as Nanaimo. They are asking for the federal and provincial governments to put in $15 million each. They point out that there has already been $30 million in investment around and along the corridor including $4 million in ties, signals, and ballast, a new bus exchange at the Langford station, new Admirals Road crossing, 2 new rail and bike bridges, and a rebuilt Nanaimo train station. Transport Action BC supports this plan and encourages members and the public to show their support by contacting the BC Ministry of Transportation, the Ministry of Transport, and politicians in charge. The Island Corridor Foundation has put together a list of people to contact. The following is a guest post by Murray Gamble of Squamish. There are two Commuter bus services in the Sea to Sky Corridor. BC Transit and PW Transportation, the third-party provider, are partners in both. There are different Municipal partners for the two services. The Squamish Commuter, between Squamish and Whistler, is run by the Resort Municipality of Whistler. Squamish provides half of the local Municipal funding but, has no participation in the operation. The Pemberton Commuter, between Pemberton and Whistler is operated by the Squamish-Lillooet Regional District, with funding from Pemberton and Mount Currie. In 2010, near the end of its Operating Agreement, Whistler attempted to reduce its costs by raising fares 60%. In November, a monthly pass went from $145 to $232. Service was uncertain beyond December 31. Eventually, limited service was to be offered until March 31. Finally, regular service was extended to March 31. Service beyond March 31 remains doubtful. Parallel to this, the Squamish-Lillooet Regional District has been collecting information and reports toward the goal of discussing Regional Transit within the SLRD. There seems to be little doubt that there will be a period without inter-community transit between the cancellation of the Squamish Commuter and the implementation of any form of Regional Transit. A group of Transit Advocates is proposing an interim service model. Currently, it is possible to travel both ways between Pemberton and Squamish every morning. It involves two buses, run by different Municipalities, with different printed schedules and a change of buses in Whistler. Few people know about these trips which take 1 hour and 45 minutes. The same distance takes 1 hour and 30 minutes to drive. The first suggestion is to combine these trips to provide through service and to make the information available in a combined schedule. In the afternoon and evening the Squamish Commuter makes a scheduled trip from Squamish to Whistler, spends a few hours servicing routes within Whistler, then makes its scheduled return trip to Squamish. Instead of serving as a Whistler bus between it’s Commuter trips, it could continue to Pemberton, providing through service between Squamish and Pemberton. 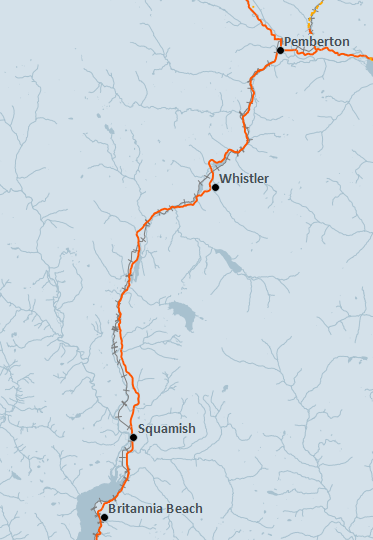 It could leave Pemberton to coincide with it’s return trip from Whistler to Squamish. By combining the morning trips and extending the afternoon and evening trips, morning, afternoon and evening service would be provided in both directions. The last trip to Pemberton would leave Whistler at about 10:45 pm, providing a much requested late trip between the two communities. Squamish does not currently have evening Transit service through the week and has no service on Sundays or Holidays. If the Squamish Commuter started its evening service earlier and followed the Southbound drop-off route before beginning the Northbound pick-up route, a very basic evening service would be available in Squamish 7 days per week. This trip could be added to the Squamish Transit schedule. Combining the morning trips and extending the afternoon and evening trips would provide 3 trips in each direction. Transit service would connect Pemberton, Whistler and Squamish. It would involve adding less than 5 service hours to the existing Squamish Commuter schedule. It has also been suggested that service be extended to Black Tusk and Pinecrest Estates, between Whistler and Squamish. In 2010, Federal Gas Tax monies were used to build an area for buses to pull off Highway 99 and turn around. It has since been equipped with a shelter. The Commuter bus drives within sight of the bus shelter but, does not stop there. Efforts to promote this plan include long letters to Elected Officials, edited versions in local newspapers, interviews on CBC Radio and a presentation to the Board of the Squamish-Lillooet Regional District. For more information, to join the Cause or to make a comment, visit Pemberton Whistler Squamish Bus, on Facebook. Murray Gamble, a Squamish resident has been mounting a campaign to save the bus that runs between Squamish and Whistler. The loss of Commuter transit between Squamish and Whistler, which will end as special funding drys up, is happening at the same time that the Squamish-Lillooet Regional District is looking into Regional Transit. It seems like these cities should work together to create a system that will link the region together. Finding a way to save these intra-regional trips that exist already would be a good first step.